Welcome to Victorian England! 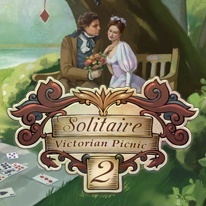 You have the unique opportunity to dive into a magical atmosphere of love and romance in Solitaire Victorian Picnic 2. Watch a relationship grow in the Victorian era; where and how the first date took place, how they lived and what their customs were, and what the ladies and gentlemen wore. Dive into an atmosphere of enchanting dances at a wedding ball in Britain in the high society of the lords of London. - Learn how the adventure ends - beat 120 levels with varying difficulty!